This athletic looking and high-performance BMW vehicle is available at Budds’ BMW Hamilton! 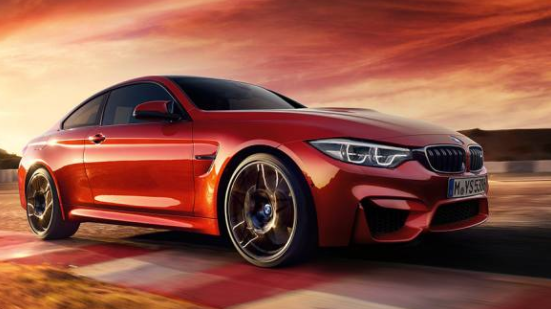 If you are looking for ao vehicle that most closely resembles a racecar, then the BMW M4 is for you. A high-performance athlete for the road and the racetrack, for perfect drifts, high-speed bends and the long straights in between. For adrenalin-steeped driving experiences, when the hands enclose the high-grip steering wheel with fingers at the ready to flick the responsive shift paddles. The driver in the M sport seats becomes one with the vehicle. The BMW M4 at Budds’ BMW Hamilton is sure to give its driver an exhilarating experience every time they get behind the wheel. Continue reading this page to get more information about the BMW M4! The 3.0-litre M TwinPower Turbo inline 6-cylinder petrol engine blends the best of two worlds: a high-revving character capable of up to 7,600 rpm, and superior power culminating in peak torque of 406 ft-lb. Bi-turbo direct injection and typical M fine tuning make sure the engine responds directly to even the slightest touch of the accelerator with vigorous thrust and confident traction. The BMW M4 can go from 0 to 100km/h in 4.1 seconds. The curved styling with the typical gently sloping roofline of a coupé, combined with the exclusive light alloy wheels and the aerodynamically optimized M exterior mirrors, radiates concentrated sports appeal. The stretched silhouette is concluded by a distinctive rear and expresses pent-up power. This BMW M4 is a very aggressive looking sportscar. It exudes athleticism and is sure to turn the heads of onlookers on the road. The BMW M4 at Budds’ BMW Hamilton has completed hundreds of tests on the racetrack in order to hone numerous innovations derived from motorsport to production maturity. The result is more than impressive: concentrated power with a breathtaking acceleration meets extremely agile and high-precision handling. In any driving situation and on any road surface, the BMW M4 guarantees an adrenaline rush combined with a permanent smile. For more information about the BMW M4 at Budds’ BMW Hamilton, please feel free to continue browsing through our website. Also, for other interesting content, much like what you just read, please feel free to visit our blog page. We can be reached at (905)387-7507 or by filling out our contact form.